In this exhibit you will take a time-traveling adventure and meet real people who came to Rhode Island from many different countries. Hear their stories and find out why they came, what they brought and how they changed the Ocean State. We all have stories about our families and how they came to the United States. While each of us reflects our individual culture, we share a common bond. Almost everyone living in Rhode Island has family roots in another country. Each group has experienced being new and different and all have brought customs, objects and perspectives that continue to enrich our communities. Coming to Rhode Island celebrates the cultural diversity of the Ocean State. 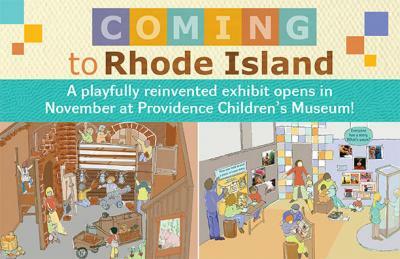 In the exhibit’s four story galleries, visitors discover the stories of actual people who immigrated to Rhode Island. The galleries are set in their historical context from an English colonist’s farm to a Latino bodega in the 1960s. Hands-on activities bring the stories to life. Children work as masons in a partial reproduction of the construction and living sites at Fort Adams in Newport, set in 1835, and climb aboard a replica packet ship to learn about the voyage from the Cape Verde islands. The exhibit culminates in the Story Center, where families engage in activities exploring culture, diversity and individual differences and discover a wider range of stories of living in and coming to Rhode Island, including their own stories. Play games and discover music from around the world, build with face blocks to create unique faces and expressions, draw a self-portrait and share something that’s important about you that nobody sees, interact with an art installation to discover how something (or someone) looks from different and unexpected perspectives, and browse books representing many people and cultures. Coming to Rhode Island is recommended for children ages 4 and up – and their adult caregivers – for maximum understanding. Very young children also enjoy pretending in the exhibit’s historical environments. Exhibit is included with $9 museum admission; free for museum members. Coming to Rhode Island is supported by The Children’s Workshop Foundation; CollegeBound Saver; June Rockwell Levy Foundation; Murray Family Charitable Foundation; The Providence Journal Charitable Legacy Fund; Rhode Island Council for the Humanities and the National Endowment for the Humanities; The Ryan Family Foundation; and Nancy Smith Worthen, in memory of Margaret L. Worthen (as of October 11).